Fashion accessories with a name and with character. Let me introduce LSD or as he is called on formal occasions: Larry Seymour Diamond. 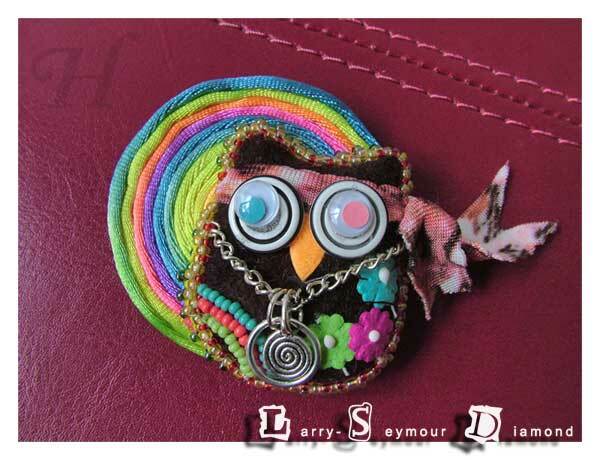 LSD is a handmade owlet brooch. His friends call him LSD and he takes it to heart and dresses to suit. He was born in July 2010 as a trippy entry into the YOJ (Year of Jewellery) LSD theme challenge; hosted by Beading Forum Australia. However it is impossible to tell Larry-Seymour Diamond, aka LSD, that he is in the 21st century and not really part of the Hippy era. He rolls his pink and blue eyes around, swings his head and tosses his headband around, flounces his little hippy, flippy pendant, flashes his colorful flowers and says, "Peace, Man. Be cool!" Much as I love LSD, I would be happy if LSD could find a home with happy vibes and groovy people. 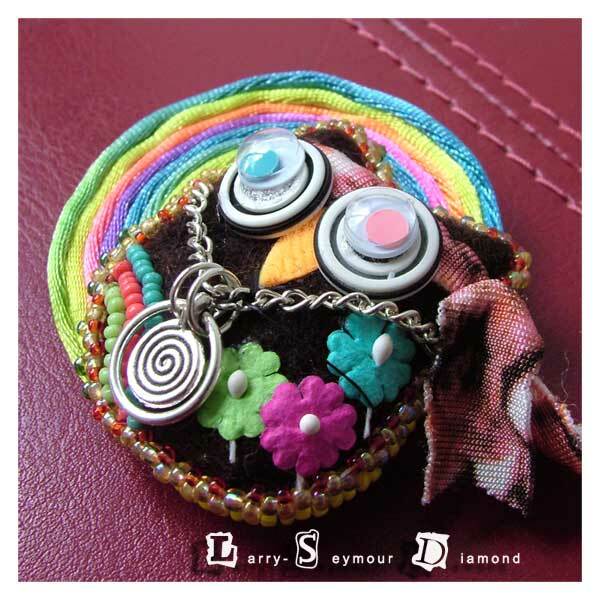 Happy to say that LSD was the winner in YOJ (Year of Jewellery) Theme: LSD!!! - held by Australian Beading Forum. 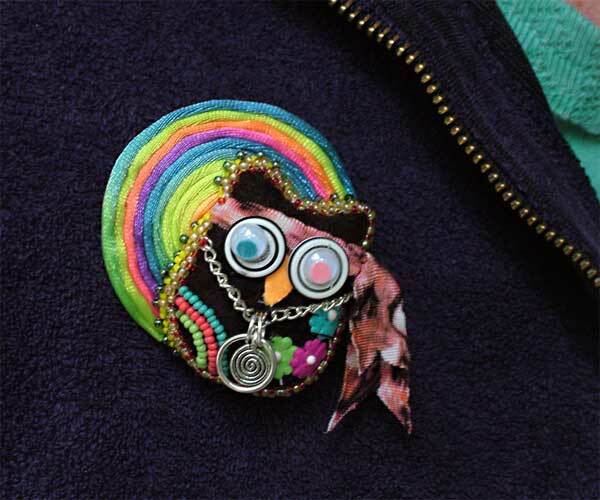 LSD is a needle felted owlet. His chain hangs semi-freely. He is on a hand-coiled neon cording and has been beaded with seed beads all around. 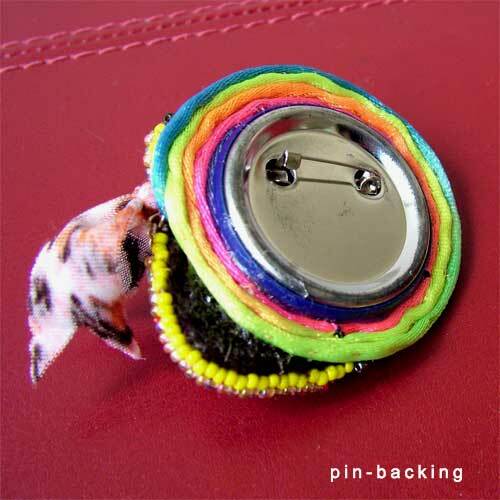 His back here shows that he has been attached to a round pin-brooch to give him some body. Here is a photo of Larry aka LSD, pinned onto the chest of a cool dude. That dude is so cool that he refuses to let his face be shown for fear of creating a fever of excitement! LSD found a home with a very cool couple and the first thing they did was take him along for a music fest (Splendour in the Grass, if I remember correctly). 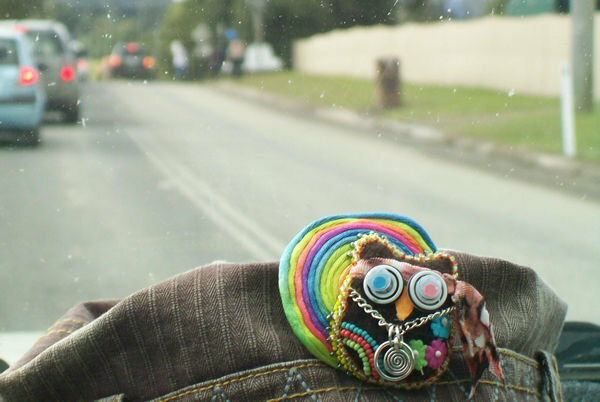 This is him, riding in the back seat, on his way to his first music fest. You can tell, with such like minded folks, LSD has truly found his ideal home.